These are very graphic pictures. Please do not feel pressured in any way to view these photos. They are only up because, for some people, knowing EXACTLY what is going on in surgery can be a comfort, and we would love to share these with those whom it would comfort and console. 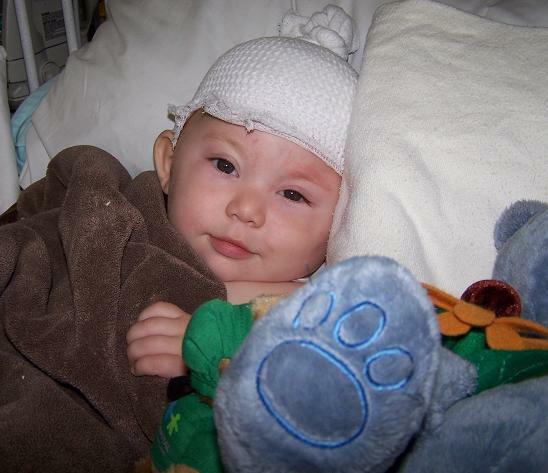 Remember, Julian's first surgery was a HUGE surgery, releasing four sutures...not something that most babies go through. 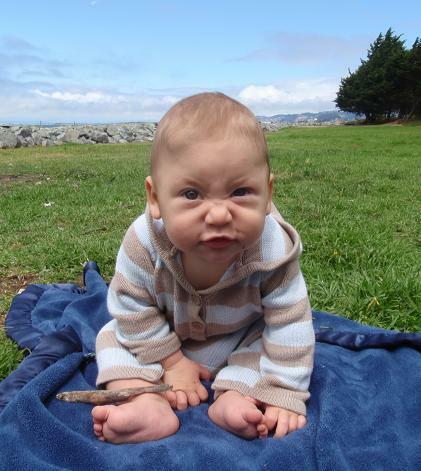 Not exactly what your baby will be going through, probably. Blood, bone and brain are all evident here, so please be warned. Since we call Jules our "Square-Headed Alien" and our "Monkey" interchangeably, and have decorated his room in stars, planets and space-ships, it only seems fair that the page include pictures of this first contact between kindly square-headed aliens and a space-monkey.